Home Costs > How Much Does Laundry Detergent Cost? How Much Does Laundry Detergent Cost? According to Procter and Gamble, the average family does about 300 to 400 loads of laundry a year or about six to eight loads per week. With every load, of course, will come the laundry detergent and whether you make it or purchase it at a store, it will come at a price. On average, laundry detergent will depend on the type, the size of the bottle, brand and where it’s being purchased. If we are pricing it by the fluid ounce, the costs will be about $0.05 to more than $0.33 per ounce. Larger 210-ounce bottles will be closer to the $0.06 to $0.13 per ounce, while laundry detergent “pacs” will be the most expensive type to buy. For instance, the Tide PODS 42-count pack retails for about $12 or $0.32 per ounce, while the 100-ounce Tide Mountain Spring scented liquid laundry detergent retails for about $12 or $0.12 per ounce. We took a look at some of the most popular brands and include the costs and the load offered per bottle. Laundry detergents will commonly come in three forms: liquid, a powder or pacs/tablets. Liquid laundry detergent will be based on the size of the bottle, and on the label, you may notice the terms “2X” or “3X.” This means the formula will be that much more concentrated than the regular detergents. Powder detergent will be straightforward and will have to be scooped out and added to your laundry. Refer to the package to see how many loads the box offers. Tablets, also referred to as a relatively new concept where the laundry detergent is compacted into a small pack, similar to a dishwasher tablet. Special features, depending on the alcohol-free, ammonia-free, cruelty-free, dye free, fragrance-free, hypoallergenic and/or paraben free. According to the Environmental Protection Agency, the most common ingredients will include surfactants, bulking and building agents, bleaches and optical brighteners. Some detergents will use enzymes to break down stains, while other brands may use de-caking agents and/or solvents. Scent boosters, which can be mixed with your laundry detergent to add a scent, can cost about $6 to $11 for a 56-count pack. 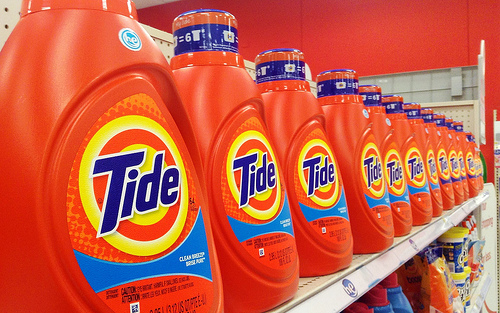 According to a recent Consumer Reports study, Tide, which costs 23 to 28 cents per load, was able to snag the top position as the best laundry detergent for all machines, but they also noted Sam’s Club and Costco’s Kirkland brand was able to produce similar results for half the cost. Always make sure you’re using the right detergent designed for your machine. If you have an HE machine, make sure the HE label is on the bottle’s label or else you could end up with too many suds in your clothes. How much laundry detergent to use? For accurate guidelines, refer to the label on the detergent to see how much you should use. Failing to use too much or too little could result in different results. How much you should use will depend on how dirty the clothes are, the size of the load and your water’s hardness. A medium-sized loan will be about seven pounds, and to determine seven pounds, it will be when your washing machine is about two-thirds full. If you’re washing clothes with a lot of stains or dirt on them, you will want to use more than what the label recommends, often to the top of the cap line. People with hard water should also use more detergent as well. Those who prefer to use the tabs you will have to consider adding two instead of one since two will count as a “double” load. If you see too many suds, this means you’re not measuring properly and can lead to wearing down your high-efficiency machine. Always make sure you pay close attention to the lines inside the detergent’s cap. Still unsure? After a clean load, feel the clothes to see if they are still wet. Too much soap will often lead to a sudsy residue or stiff feel. Laundry detergent brands are notorious for having coupons online and in the local paper. Look online or even at your local grocery store’s app to see if there any savings. A simple search such as “Purex laundry detergent coupons” or “Persil detergent coupons” could yield some results. Making your own laundry detergent may be the way to go. Bargain Babe, for instance, broke it down and found that if you were to make your own detergent, you would only pay $0.02 per load when compared to spending as much as $0.21 per load with Tide.